You don’t have to be an expert to appreciate the benefits of getting a good night’s sleep. Not only does lack of sleep make you feel groggy and irritable, but sleep also plays a critical role in everything from boosting your immune system to improving your memory, promoting learning, and more. But did you know that getting the right amount of sleep can also help you avoid gaining weight? That’s right. Lack of sleep won’t just make you tired—it can also be bad for your waistline. According to the National Sleep Foundation, people who sleep for less than five hours a night are almost a third likelier to gain weight (30 pounds over the course of 16 years) than those who get seven hours of sleep each night. Chronic lack of sleep can affect you in a number of surprising ways. Sleepy people tend to be hungrier than the well-rested. When you’re tired, your body produces a hunger-stimulating hormone called ghrelin. At the same time, the hormone that makes you feel satisfied drops. As a result, you may have mad cravings for foods that are high in fat and carbohydrates, just because you haven’t been getting enough sleep. Night owls have more time to eat. Chances are, if you’re fast asleep in bed, you’re not eating (expect maybe in your dreams). If you stay up late at night, you simply have more hours in the day to eat. And, late-night snacks can make you gain weight. It’s hard to exercise when you’re exhausted. Sleep-deprived people rarely head to the gym. However, when you’re well rested, you have more energy for physical activity. Even small amounts of exercise—like brisk 10-minute walks—burns calories. Lack of sleep can mess with your metabolism. When your metabolism slows down, you burn fewer calories throughout the day when you’re at rest. Getting the recommended amount of sleep each night can help increase your metabolism. 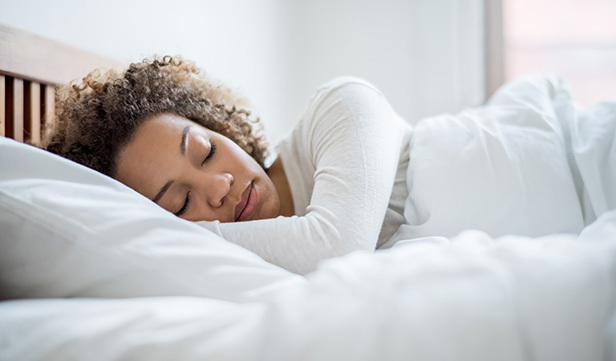 It isn’t always easy to get the sleep you need, but according to the Mayo Clinic, anyone can adopt habits that encourage better sleep. Get on a sleep schedule. Go to bed and get up at the same time every day. Staying up late (and sleeping in) on the weekends can interrupt your body’s sleep cycle. Don’t go to bed hungry, and don’t stuff yourself before bed. If you need to eat within a couple of hours of your bedtime, keep it light. The effects of stimulants can last for hours, so it’s best to avoid nicotine and caffeine at night. Alcohol can disrupt sleep, too. Your bedroom should be dark and quiet. Some people swear by earplugs, while others prefer a fan or sound machine. Use whatever works best for you. Also, while you may enjoy spending time on your smartphone or tablet before bed, light-emitting screens can make it harder to fall asleep. Try taking a bath instead. Naps during the day can interfere with sleep. If you have to nap, keep it short (no more than 30 minutes) and avoid napping late in the day. Regular physical activity and exercise can promote better sleep. Exercising too close to bedtime, however, may keep you up. Work, family responsibilities, and even the daily headlines can interfere with sleep. Try to set everything aside before bedtime. You’re not going to solve all of the world’s problems tonight. Take steps to manage your stress and ease anxiety. If you’re disorganized, get organized. If your to-do list is out of control, set priorities and delegate tasks. Getting enough sleep can help you maintain a healthy weight, but it’s just one of many factors. If you want to prevent weight gain or lose weight, be sure to eat a healthy diet and cut back on snacks and empty calories. Physical activity is important, too, but always check with your doctor before starting a new exercise program.